Among the many things I love about my job at Fordham University is that I get to deal with academics on a daily basis. Sometimes, I sit in on their classes. One of the most interesting professors is Mark Naison, professor of history and African American Studies. For as long as I’ve been here, he’s taught a very popular, hard to get into (due to it filling up very quickly) class called, “From Rock & Roll to Hip Hop: Urban Youth Cultures in Post War America.” It’s a class where music is heard (the rock & roll and soul stuff is GREAT) and special guest musicians give performances and mini-lectures. It all makes me wish I was an undergrad! Since the late 19th Century African Americans have exerted a powerful influence on the development of American popular music. Forms of musical expression developed in African-American communities have been reinterpreted and marketed to create the modern music industry, shaping the development of Tin Pan Alley, the Broadway musical stage, the record industry, the modern dance band, and music radio. Until the end of World War II, racism and lack of capital kept African-American artists and entrepreneurs on the margins of this activity, denying them access to commercial venues that would reward them for their creativity and create a national audience base outside the black community. Only a handful of Black artists -Louis Armstrong, Duke Ellington, Cab Calloway, Billie Holliday, Ella Fitzgerald, Marian Anderson, Paul Robeson- had large enough followings outside the “race market”- the section of the music industry targeted to blacks- to make them truly national figures In post World War II era, however, the terms of this cultural interchange began to shift. Civil rights victories, north and south, black migration to urban areas, and the opening of new economic opportunities in industry and government employment set the stage for a new relationship between blacks and the music industry. As radio stations in major cities began to tap into the growing African-American market, black music of all types-gospel blues, swing, rhythm and blues- began to hit the airwaves. The newest of these genres, rhythm and blues, a urban music that fused sweet harmonies and powerful dance beats, sparked a musical and commercial revolution by attracting a huge underground audience among whites. By the early 1950’s, “black” music radio from Memphis to Los Angeles was attracting hundreds of thousands of white listeners, most of them under the age of twenty five, and sparking an unexpected growth of record sales for artists who had only aimed for the “race market.” In several cities, white disc jockeys decided to tap into this new youth audience by incorporating rhythm and blues into their formats and got such a huge response that they made it the centerpiece of their shows. Calling it “rock and roll,” they marketed it as youth music rather than black music and looked for white artists who could play it to supplement the already established black stars. This marketing strategy was brilliantly successful. By the early sixties, rock and roll had become the musical language of a generation of American youth, crossing racial and cultural barriers that had never previously been bridged by the music industry. Though white entrepreneurs and artists made the bulk of the profits in this billion dollar business, scores of black artists cracked into national markets that had previously been closed to them and shaped the musical tastes of millions of young whites. Chuck Berry, Little Richard, the Drifters, the Shirelles, the Coasters, Lloyd Price, Fats Domino, Sam Cooke, Ray Charles, to name a few, were central to the early success of rock and roll, and their influence would later be built on by Motown artists like the Supremes, the Four Tops and the Temptations, and soul singers like James Brown, Otis Redding and Aretha Franklin. The terms of cultural interchange in this music were shaped by the site of its creation; the post-war metropolis. Rock and roll was the product of a long economic boom that brought blacks into the center of the industrial economy and placed them in close proximity with the descendants of white and latino immigrants. On street corners and in school gymnasiums, in clubs and theaters, in radio stations and recording studious, African-American artists and entrepreneurs mingled with musicians, producers and songwriters of other nationalities. In the earliest days of rock and roll, the sources of creativity flowed upward from city streets, but as the music became more popular, the recording industry was taken over by media conglomerates, removing its experimental, grass roots atmosphere and separating it from its African-American roots. By the late 1960’s and 1970’s rock and roll had become typecast as “white” music, identified more with its white suburban following than its African-American originators; while African-American artists moved into niches in the music market where a modified urban sensibility still prevailed- funk, disco, soul, and pop. However, African-American and Latino youths, trapped in decaying neighborhoods savaged by disinvestment and government neglect, found themselves disfranchised by these musical developments. In post-industrial cities where vacant lots, shuttered factories, and decaying schools marked the boundaries of crushed hopes and declining opportunities, young blacks and Latinos, supported by a small number of adventurous whites, invented a new music that fused verbal improvisation, scratching and back beats and fragments of previous musical genres into a jarring, densely rhythmic, compulsively danceable mix. Played in community centers and schoolyards, house parties and small clubs, the music initially attracted little interest from recording companies or commercial radio. But its extraordinary popularity among urban youth soon caught the attention of neighborhood promoters, who began recording the music, and hip audiences in the largely white downtown “punk” scene. By the early 80’s, hip hop or rap, had started to crack into mass markets and commercial radio, even though most established professionals didn’t regard it as real music. But the music accurately expressed the sensibility of people who had been left out post-industrial social order or who were rebelling against its mores. Hip hop, despite fierce skepticism and opposition, not only survived, but exploded becoming the most commercially successful musical form in the world by the mid-90’s, defining not only the sensibility of urban youth in the United States, but young people of various backgrounds all over the world. Once again African-American cultural creativity, forged in an urban setting, had redefined the musical tastes of a generation. In the course that follows, we will examine how the sensibility and musical creativity of urban youth, in two very different historical periods , inspired musical revolutions which transformed the tastes of entire generations, crossing boundaries of race, gender, nation and social class. How could this happen twice in fifty years? What does this say about the racial/cultural dynamics of post-war American society? About the connection between African-American culture and American culture? About race and gender dynamics in the culture industry? About the role of women in musical forms which emphasize an insurgent, eroticized masculinity and turn women into objects of desire and/or contempt? About how rebellion can be marketed, coopted and turned into an instrument for material gain? To get at these questions, the course will use music, film, and literature as well as historical writings on the music industry and contemporary urban life. To add depth to our portrait, we will also explore musical countercultures of international derivation particularly punk, reggae, salsa and reggaeton, and look at how folk music and jazz periodically invade and occasionally shape popular musical forms. We will also explore how these musical forms become internationalized and how they are being brought to life today in new ways in nations around the world. We have a graduate assistant working with the class, Melissa Castillo Garsow, who will give a few lectures and presentations on the globalization of hip hop. At various points in the class, people involved in the creation of the music we are studying will come to class to perform or talk about their work. There will also be an opportunity for students in the class to perform their music, inside or outside of class. We draw no line between musical creativity and musical analysis. Both are welcome in our classroom. I wanted to share a couple of recent posts I wrote for the London, England,-based Sounds and Colours, a music and culture magazine that focuses on Latin America. One cannot discuss Colombian history of the 1990s without a mention of the national soccer teams of the era. After all, the squads of that decade made Colombian history, qualifying for three World Cups in a row—Italy ’90, USA ’94 and France ’98. Now, those moments in futbol history are being played out in a telenovela by Caracol Television that has millions of Colombians hooked. The soap opera, “La Selección,” is also playing in the United States. The series focuses on four of the country’s best-known players, Carlos “El Pibe” Valderrama, Rene Higuita, Freddy Rincon, and Faustino Aspirilla. If there is one thing I equate with Colombia and its people, flag, music, Carnival, Feria de las Flores, and several other festivals, it is bright, exuberant colors. So I wasn’t surprised when I stumbled upon works by Colombian artist Jorge Luis Rosenvaig. Discover I did, and once I started clicking through to his other works, I immediately set out to find out more about the artist. Rosenvaig obliged with the following email interview. Read the Q & A here. It is described as a freak accident, because as far as automobile wrecks go, for a bus to hit a lamppost that falls on a baby in a stroller, well, it’s just not supposed to happen that way. But that’s how it went, and 8-month-old Angelie Paredes is gone. But this July 30 ‘freak accident‘ in New Jersey, which took place when a bus jumped a curb because its driver was allegedly on his cell phone, could have been prevented. The driver, who is now charged with ‘death by auto,’ did not have to use his phone while operating a vehicle. The passengers did not have to accept his behavior as a matter-of-fact habit of these discount jitney bus drivers. Dear baby Angelie did not need to die. According to the United States Department of Transportation, distracted driving (which is caused by any activity that could divert a person’s attention away from the primary task of driving) claimed the lives of 3,331 lives in 2011. 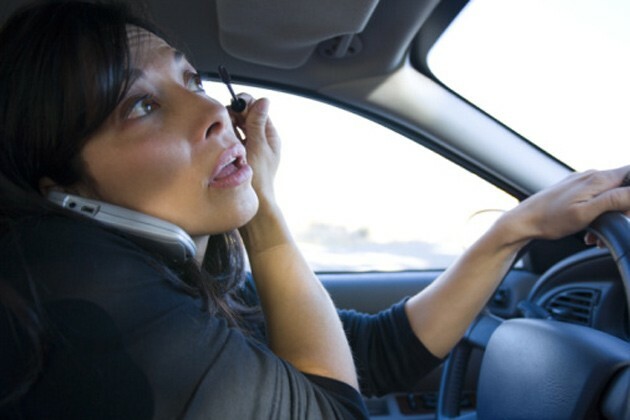 A whopping 387,000 people were injured in motor vehicle crashes involving a distracted driver. Read more of my piece in the Huffington Post. 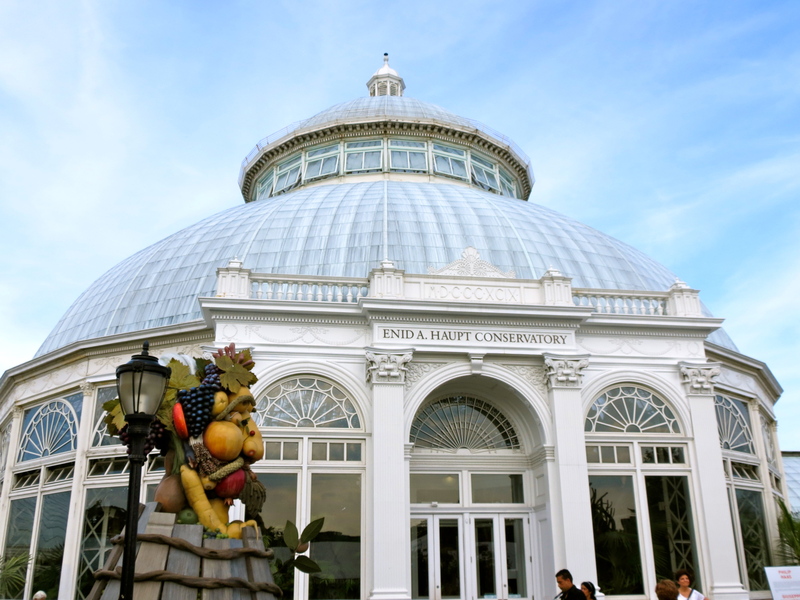 Five years living in New York City and I’d never visited the New York Botanical Garden in the Bronx. What a mistake! It’s 250 acres of gorgeous and they hold special exhibits, like the one on “Wild Medicine” (medicinal plants used all over the world) that runs until Sept. 8. They offer discounts and specials if you use your Mastercard. It’s no secret I’m the world’s biggest beach fan. It’s where I prefer to vacation as I find myself hating the cold weather more and more each year. I’ve visited and fallen in love with beaches on Colombia’s Atlantic Coast, Mexico’s Caribbean Riviera, the Bahamas, Puerto Rico, and the Dominican Republic. In the States, some of my favorites are in Miami, Myrtle Beach, and — though I no longer get into the water (too cold!) — the Jersey shore. This year, I finally got to vacation in Costa Rica. I went to Guanacaste in the country’s Papagayo Gulf region for a friend’s birthday — an all girls grip. It was beyond amazing, and the first vacation where I didn’t just “lay out” to tan. I was too busy on excursions! Pura vida is a characteristic Costa Rican phrase. Per Wikipedia, it literally means pure life, however, the real meaning is closer to “plenty of life”, “full of life”, “this is living!”, “going great”, or “real living.” The phrase can be used in many ways; for example, it can be used both as a greeting or a farewell, as an answer expressing that things are going well, or as a way of giving thanks. True! We heard it time and again. Here are some things I loved about Costa Rica. Pura Vida! Temperature: the best thing about going to the Guanacaste region in early August is it isn’t unbearably hot. It’s warm, and in our case, it was sunny (they haven’t been getting much rain, something uncharacteristic for the region’s rainy season), but we never sweated bullets. Rain: As explained above, the summertime in the U.S. is Costa Rica’s “rainy season,” more so in the capital of San Jose than in Guanacaste, although we heard Guanacaste had a pretty dry July in 2013. Proximity to the New York area: You can’t beat a roughly four hour trip. Two hours to Miami and then another couple to the airport in Liberia. I was sold. Our resort: We stayed at the Hilton Papagayo. It was wonderful. We loved the food, the pool and its swim up bar, and the warm and attentive employees. We wished there was more of a nightlife on the resort, but we made due by going to nearby club and bar strip on Coco Beach (go to Lizard and Z-Lounge on Friday and Saturday nights!). Segura took us: clubbing (he provided roundtrip transport and even hung out for a bit, though he responsibly didn’t drink, of course); ziplining at the Congo Canopy Trail; to the waterfalls at La Fortuna, the volcano at Arenal; to eat typical Costa Rican breakfast and lunch; an eco-center where we saw frogs, a sloth, butterflies, and more; and a Hot River. He can take you to all of the above plus: horseback riding, tubing, hot springs, and lots, lots, more. Contact him via email to get details. Visit his Facebook page here. 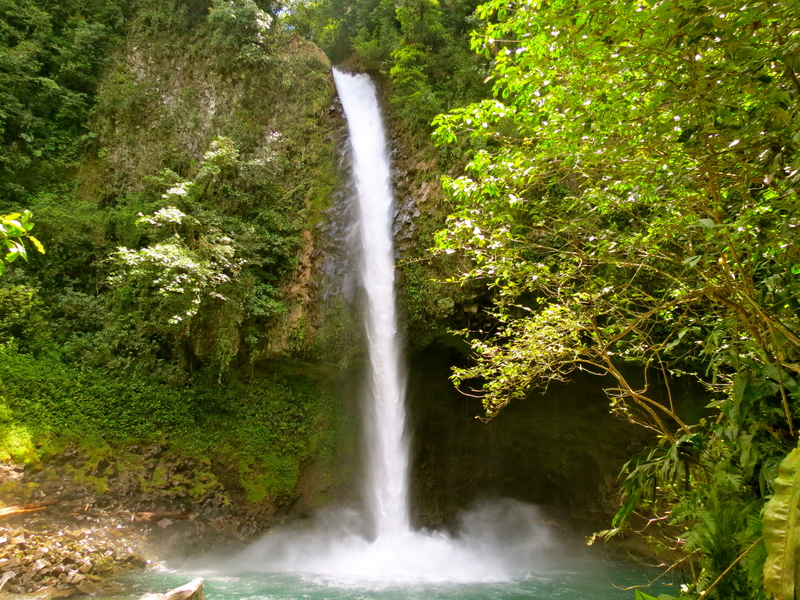 Animals / Ecotourism: For the most part, Costa Rica seemed like the most eco-friendly place I’ve ever visited. Recycling and composting bins are a mainstay, animal refuges are aplenty (howler monkeys and sloths! ), and the greenery is stunning for a reason. The ticos (nickname for Costa Ricans) take care of their country. To book this trip, we bought the airfare first (most of us used Kayak) and then the hotel. We got decent prices (about $800 for both for about five days.) I hear there are Groupon and Living Social deals floating around out there. I’d suggest exploring a trip to this gem of a country. Pura Vida!